The excellent sound characteristics, superior acoustics and elegant atmosphere of the concert hall along with the solemn sound of the pipe organ, makes the concert hall an ideal environment for performances. As the home of the Orchestra Ensemble Kanazawa, established and developed in Ishikawa, the concert hall provides a place to perform and appreciate chamber and orchestral music. The hall was designed as a result of repeated acoustic exercises and the opinions of experts, all giving careful consideration to reverberation times, shape and capacity of the hall, ceiling, seat configuration and interior finishing materials. In particular, the hall was designed as a shoe-box type, taking into consideration and balancing the landscape, the total configuration of the building and audience capacity to achieve a sufficient echo. The seating capacity is just 1560 which is appropriate for the appreciation of chamber music and creates well-balanced acoustics and an impressive sense of reality. With an audience of 1560 this hall is the same as Gewandhaus in Leipzig. The shoe-box style originated in Gewandhauss. It may be said that this is one of the ideal concert halls where various repertories of classical music are played. Shoe-box style is mainly directed toward classical music. The term "shoe-box" refers to the shoebox shape of the hall. Gewandhaus, completed in 1781 in Leipzig, is thought to be the origin of this design. The shoe-box style provides sufficient sound reflection from its sides producing a rich sound. It is believed that the shoe-box configuration is one of the best for classical music concert halls. Other halls with famous orchestras, such as the Musikverein of Vienna and Concertgebouw of Amsterdam, are based are the shoe-box design. 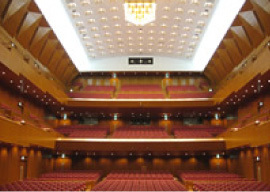 The stage and main level of the Concert Hall is located on the second floor of the Ongakudo, and the Concert Hall extends upward a further two levels. The audience seating is composed of the first level seats, the second level seats, the second level balconies, the third level seats and the third level balconies. Wheelchair access is provided. There are dressing rooms and musical instrument storage rooms on the same level as the stage and the level above the stage. These can also be used from the Hogaku Hall. Additional facilities are located in the first level entrance hall, on the JR Kanazawa Station side, including a bar and cloakroom. The second and the third level foyers help to create an enjoyable concert environment. ten Western-style rooms all with large mirrors and TV monitors. Bar, Cloakroom, Foyer, Showerstall, etc.